Thanksgiving has always invoked a sense of gratitude and love of family for me. My maternal grandparents were married on this holiday in 1925. My 10th and 11th great grandparents, George Soule and John Alden arrived on the Mayflower 398 years ago. I got married in April, bought a new home in August, and invited my husband's whole family to celebrate Thanksgiving at our house in November. Did I mention he has eight siblings? That was a few years ago but many of those recipes have remained my go-to menu choices. It is really quite simple as the turkey, stuffing, and mashed potatoes are a good foundation. The vegetables vary and the pie selection rotates. Some things have changed. I have brined my bird, made my own cranberry sauce, and given up on the dinner rolls as I kept forgetting them in the oven. And then there are things that cannot change, that to eliminate them is to destroy tradition. Such is the case with "my" sausage and cornbread stuffing. 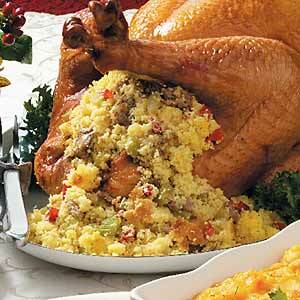 Looking for an alternative to bread stuffing? Try this one. I have already purchased some of my ingredients. Prepare stuffing mix in a large bowl according to package directions, using 1 cup of water, 1/2 cup of butter, and bouillion cubes. In a medium skillet melt the remaining 1/2 cup of butter. Add the red bell pepper, onion, and celery; cook over medium heat until the onion is tender. Add to stuffing mixture. In the same skillet cook sausage until well browned; add to cornbread mixture with pan drippings and remaining ingredients. Mix to blend well. Makes 10 cups. Stuff into Turkey cavity immediately and cook with the turkey.